Deep foundations typically support dead and live loads through a combination of positive skin friction acting along the sides of the pile and end-bearing at the toe of the pile; however, during seismic events, negative skin friction (or downdrag) can potentially develop. Downdrag occurs because of increases in effective stress caused by pore pressure dissipation and settlement by the liquefiable soil layer(s) relative to the pile (figure 1). This phenomenon creates a dragload that the pile must support in addition to its permanent service pile head load (Qτ). As illustrated in figure 1, the depth of the dragload extends to the neutral plane. The neutral plane is the depth where the settlement of the pile equals the liquefaction settlement of the soil and where the axial load in the pile is the greatest. The elevation of the neutral plane is found by trial and error such that the service load plus negative friction should equal the positive friction plus end-bearing resistance. Figure 1. Sketch. Relationship between liquefaction-induced settlement and skin friction. 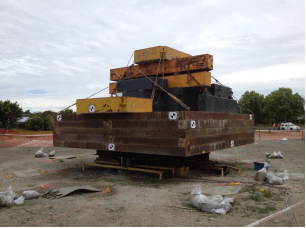 To evaluate the skin friction of CFA piles, a blast-induced liquefaction test program was conducted at a site in Christchurch, New Zealand. During the tests, load versus depth was measured in three instrumented, full-scale, 0.6-m diameter CFA piles of various lengths. The test program included two sets of blast-induced liquefaction, the first without load on the piles and the second with load on the piles. The blasts liquefied a 10-m layer of sand along the length of the pile. The axial load distribution along the length of the pile because of negative skin friction was measured after liquefaction and reconsolidation. This report focuses on the test results of the loaded piles as compared to conventional design practice. To define the soil profile at the site, a cone penetration test (CPT) sounding (with a piezocone) was performed prior to installation of the test piles (figure 2).The soil profile at the site generally consisted of three soil types: approximately 1.5 m of sandy silt at the top, approximately 9 m (from 1.5 to 10.5 m depth) of poorly graded medium-dense clean sand, and then at least 6 m (from 10.5 to 16.5 m depth) of inter-bedded layers of medium-dense to dense clean sand. 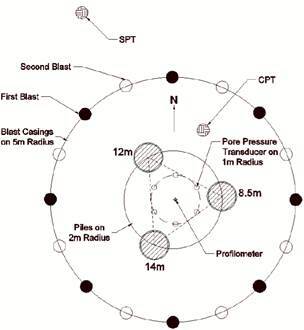 A soil penetration test (SPT) boring was also performed within 3 m after installation of the piles (figure 2). The three CFA test piles, each with a nominal diameter of 610 mm, were 8.5, 12, and 14 m in length. Results from thermal gauge wires on each test pile indicated that the pile diameter was relatively consistent in depth with no significant anomalies. The piles consisted of high-strength (38 MPa) concrete with a steel rebar cage the full length of the shafts. Two strain gauges were attached at 180-degree spacing around the circumference of the reinforcing cage at intervals of 1.5 m along the pile length. The strain gauges were damaged during the static load test setup for the 8.5-m pile. Figure 3 and figure 4 illustrate plan and profile views of the test piles relative to the blast holes and instrumentation, respectively. A 10-m-diameter ring of eight equally distributed blast holes at 45-degree spacing around the circumference of the ring surrounded the test on the unloaded CFA piles. For the second test on the CFA piles with axial load applied, an additional set of eight blast holes were located along the same blast ring at an offset of 22.5 degrees from the original blast positions (figure 3). 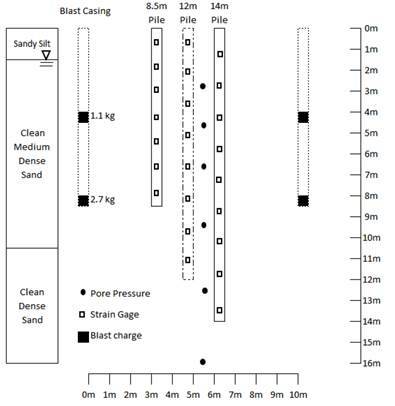 As shown in figure 4, charges of 1.1 and 2.7 kg were located in each blast hole at depths of 4.0 and 8.5 m, respectively. Based on a pilot test, it was found that by sequentially detonating the eight explosive charges located at a depth of 8.5 m first, followed by the eight charges at a depth of 4.0 m, each at 300 ms intervals, the soil to a distance of 8 m from the center of the blast ring would liquefy. Figure 2. Graphs. Subsurface investigation results. In addition to monitoring pile response from the blast-induced liquefaction, pore pressure and ground settlement were also evaluated. 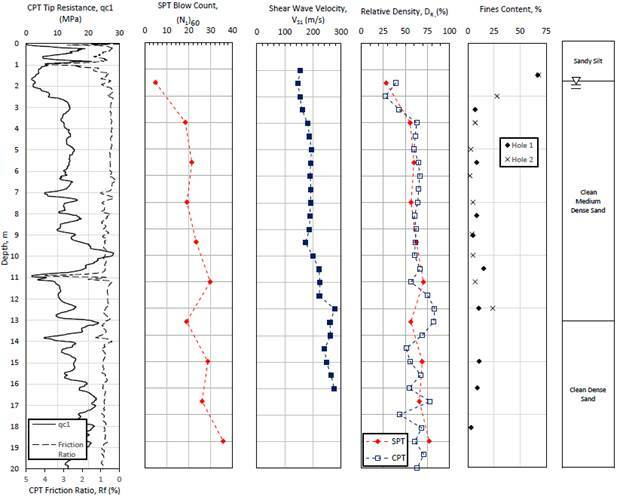 Excess pore pressure during the blasting process was monitored with 6 piezometers at depths of 2.75, 4.85, 6.8, 9.7, 12.8, and 15.85 m below the ground surface (figure 4). The piezometers were located about 1 m from the center of the blast ring (figure 3). The ground settlement as a function of depth was monitored with a profilometer located at the center of the test area (figure 3). Soil settlement was measured at 0.6 m intervals along the length of the profilometer. Figure 3. Illustration. Plan view of the layout of test piles and explosive charges. Figure 4. Illustration. Profile view of the instrumentation and soil profile. Static load testing was performed on the pile group between the liquefaction tests of the unloaded and loaded piles. The intent of the static load testing was to provide information on the actual capacity of each pile in side resistance and end-bearing after the first liquefaction test when the surrounding soil was no longer in a liquefied state. Load deflection curves from the static load test are shown in figure 5. The 8.5-m pile was loaded to failure at 125 metric tons and settled a total of 33 mm. This displacement represents nearly 5 percent of the measured pile diameter, which is typical of the displacement necessary to develop ultimate end-bearing resistance. The load applied to the 12- and 14-m piles did not fully mobilize to end-bearing resistance conditions; both piles settled approximately 12 mm under the maximum applied load of 125 metric tons. At this displacement, the ultimate side resistance for both piles would likely be almost fully mobilized. (10,11) In contrast, at this displacement, the end-bearing resistance was likely only 45 to 55 percent of the ultimate resistance defined by displacement equal to 5 percent of the pile diameter. (12) Additional load to obtain a failure condition was not added because of limitations of the reaction assembly. Figure 5. Graph. Load deflection curves from static load testing. The load deflection curves for the 12- and 14-m piles are nearly identical. The reason likely has to do with the method of installation of auger-cast piles that may cause differences in the concrete quality, soil density, side friction, or shaft shape at the toe of the pile. For example, when the 14-m pile was constructed, the trap door on the auger failed to open during the initial penetration of the auger. Therefore, the auger was extracted by reversing the rotation, the trap door was reset, and the hole was re-drilled to the desired depth where the concrete was injected. This re-drilling process may have reduced the unit side resistance and end-bearing resistance even though the pile diameter was relatively consistent. 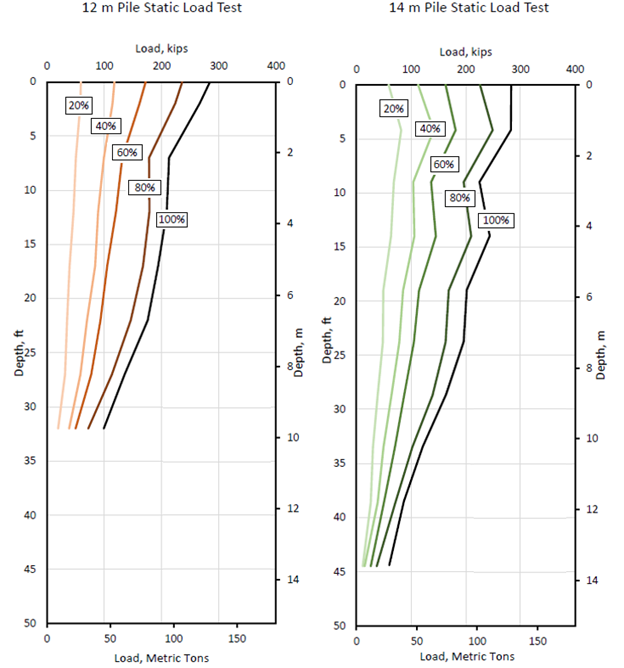 Based on the static load testing, plots of the measured load in the pile versus depth for both the 12- and 14-m piles, at increments of 20 percent the maximum static load, are provided in figure 6. In each of these plots, the load at the top of the pile was measured by a load cell, while load in other areas of the pile was interpreted from the strain gauge readings. As previously mentioned, measurements of skin friction are unreliable for the 8.5-m pile, so results cannot be determined. Figure 6. Graphs. 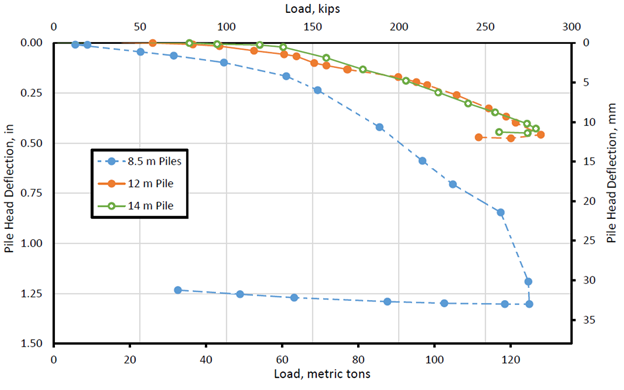 Progression of load in the 12- and 14-m piles during the static load test. The measured values for end-bearing resistance and side friction were compared with the Federal Highway Administration (FHWA) guidance for CFA piles. (12) When supported in cohesionless soils where the SPT-N value at 60-percent hammer efficiency near the pile tip (N60) is less than 75, the ultimate end-bearing resistance (Qp) is found using equation 1. For SPT-N values greater than 15, the side friction is found using equation 2. Where Ab is the area of the pile base. Where qs,i is the unit skin friction at a depth (z) equal to i (equation 3) and As,i is the surface area of the pile at a depth (z) equal to i. Because the piles did not settle 5 percent of the diameter, it is unclear how much end-bearing was mobilized. When comparing unit side friction, however, it was found that equation 3 estimates values much higher than that measured in the static load test. The best agreement with measured load versus depth curves was obtained using scaling factors of 70 and 55 percent of skin friction anticipated by equation 3 for the 12- and 14-m piles, respectively. As previously mentioned, blast-induced liquefaction was conducted first on the piles without axial load and then, after static load testing, a second round of blasts was conducted around the surrounding soil with axial load applied on the piles. The photograph in figure 7 shows the configuration of the static load prior to the blast. The applied dead loads were 44, 112, and 118 metric tons for the 8.5-, 12-, and 14-m piles, respectively. 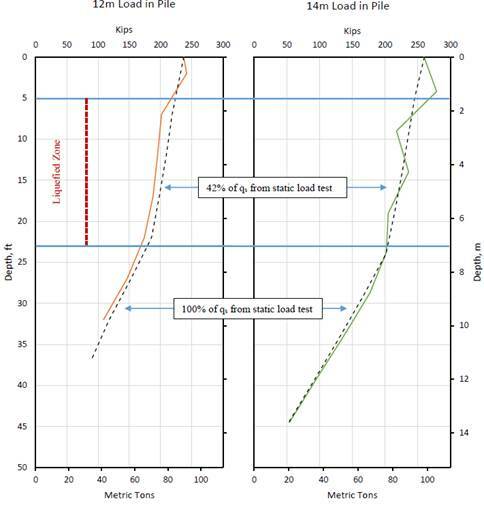 Based on predicted pile capacities estimated from the static load tests, the dead loads represented a factor of safety of 3.0, 1.23, and 1.14, respectively. Detonation of the explosive charges caused liquefaction around the loaded piles between depths of 4 and 7 m (figure 8). The ground surface within the blast ring settled approximately 80 mm, and the 8.5-, 12-, and 14-m piles settled 103, 104, and 71 mm, respectively. Based on the string pot measurements, it appears that most of the settlement occurred shortly after the blast. Figure 9 shows a soil settlement with depth. Figure 9 also shows the profilometer settlement from the first blast with no load and the Tokimatsu and Seed (1987) prediction for liquefaction-induced settlements. (13) The profilometer from the second blast matches very closely with the curve from the Tokimatsu-Seed method. Figure 7. Photo. Dead weight on test piles immediately prior to the second blast test. Figure 8. Graph. Excess pore pressure from the two blasts. Figure 9. Graph. Settlement profiles for the two test blasts and the predicted profile using the Tokimatsu-Seed method. 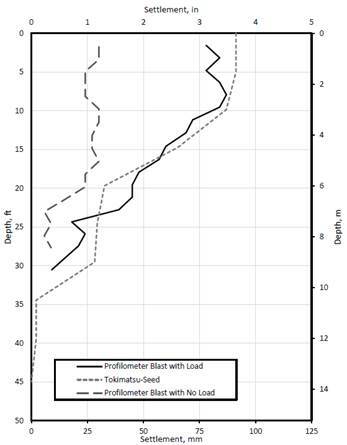 Load as a function of depth for the 12- m and 14-m CFA piles was measured for conditions 45 min after blasting (figure 10). There is a visible change in the skin friction at a depth of about 7 m for each pile. The dotted line in figure 10 illustrates 42 percent of the skin friction values measured from the static load test (or 25 percent as computed using equation 3) above a depth of 7 m, and 100 percent of the skin friction values from the static load test (or 60 percent as computed using equation 3) below a depth of 7 m. This depth of 7 m is in agreement with measured excess pore pressures. With the measured pile settlements of 104 and 71 mm for the 12- and 14-m CFA piles, respectively, both of which are greater than 5 percent of the shaft diameter, it is expected that maximum end-bearing resistance would have been mobilized. By extrapolating the load versus depth curves in figure 10 to the bottom of the pile, end-bearing resistance is estimated at 35 and 18 metric tons, respectively. The measured end-bearing values were only 46 percent of those anticipated for the 12-m CFA pile based on equation 1 and 14 percent for the 14-m pile. Figure 10. Graph. Load in the piles after the second blast showing resistance in liquefied and nonliquefied sections. There are at least two possible reasons that the end-bearing is so much smaller than anticipated. First, there may be variability in the soil profile; however, this explanation seems unlikely for this test program because blow counts would have to have been considerably low to match the end resistance (figure 10). Second, the method of installation of auger-cast piles may cause differences than what is anticipated in design. As previously mentioned for the 14-m pile, the trap door on the auger failed to open during the initial penetration. The process to reset the trap door apparently left a relatively loose layer at the bottom of the shaft, which likely explains the low end-bearing resistance. For the piles with applied dead load, the load was great enough and the end-bearing resistance was low enough that the piles settled relative to the surrounding soil when the pile came to equilibrium. Therefore, the skin friction was all positive along the length of the pile even within the liquefied layers. Back-analysis indicated that the side friction in the liquefied layer after reconsolidation was approximately 50 percent of the positive skin friction measured from the static load test. 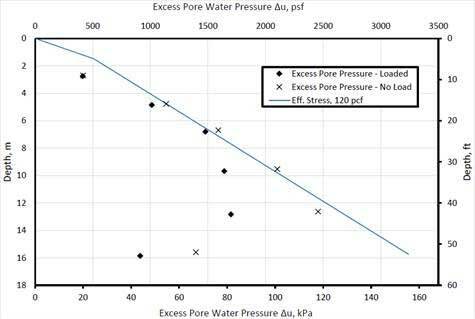 The results are consistent with previous negative skin friction measurements reported by Rollins and Strand (2006) for a steel pile after blast-induced liquefaction. (9) The consistency of these results strongly suggests that skin friction in liquefied layers is not zero as is often assumed but should instead be considered as about 50 percent of the pre-liquefaction skin friction in assessing downdrag and pile settlement following liquefaction. 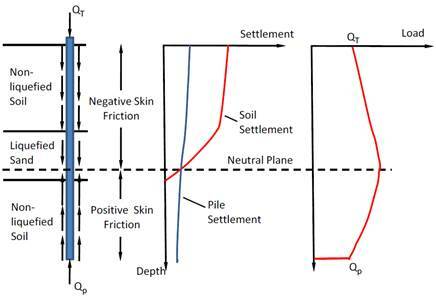 Negative skin friction can rapidly change from negative to positive friction if the pile settles more than about 12 mm, which is the displacement necessary to mobilize skin friction. It is quite difficult to predict settlement behavior beyond settlements of 5 percent of the base diameter. Therefore, the piles should have sufficient resistance from both skin friction and end-bearing below the liquefied zone to prevent excessive settlement of the pile considering the applied load on the pile and negative skin friction. Funding for this study was primarily provided by a grant from the U.S. National Science Foundation (Grant CMMI-1408892) with supplemental funding from the Pacific Earthquake Engineering Research (PEER) Center (Research Agreement Number: 1110-NCTRKR), FHWA (DTFH61-14-P-00070), and the Utah Department of Transportation Research Division. We also acknowledge the contributions by Michael Olsen from Oregon State University and Tonkin & Taylor in New Zealand in performing this study. Fellenius, B.H. (2006). “Results From Long-Term Measurement in Piles of Drag Load and Downdrag,” Canadian Geotech Journal, 43(4), 409–430, Ottawa, ON. Boulanger, R.W. and Brandenberg, S.J. (2004). “Neutral Plane Solution for Liquefaction-Induced Downdrag on Vertical Piles,” Proceedings, ASCE Geo-Trans Conference, ASCE, Reston, VA.
Fellenius, B.H. and Siegel, T.C. (2008). “Pile Drag Load and Downdrag in a Liquefaction Event,” Journal of Geotechnical and Environmental Engineering, 134(9), 1412–1416. AASHTO. (2014). LRFD Bridge Design Specifications, Seventh Edition, American Association of State Highway and Transportation Officials, Washington, DC. Kulhawy, F.H. and Hirany, A. (1989). “Interpretation of Load Tests on Drilled Shafts – Pt. 2: Axial Uplift,” Foundation Engineering: Current Principles & Practices, GSP 22, 1150–1159. Hirany, A. and Kulhawy, F.H. (2002). “On the interpretation of drilled foundation load test results,” Deep Foundations 2002, GSP116, Vol. 2, 1018–1028. Brown, D.A., Dapp, S.D., Thompson, W.R., and Lzarte, C.A. (2007). “Design and Construction of Continuous Flight Auger (CFA) Piles,” Geotechnical Engineering Circular No. 8, FHWA, Report No. FHWA-HIF-07-03, Washington, DC. Tokimatsu, K., and Seed, H.B. (1987). “Evaluation of Settlements in Sands Due to Earthquake Shaking,” Journal of Geotechnical and Environmental Engineering, 103(8), 861–878. Rollins, K.M. and Strand, S.R. (2006). “Downdrag Forces Due to Liquefaction Surrounding a Pile,” Proc. 8th National Conference on Earthquake Engineering, Earthquake Engineering Research Institute, San Francisco, CA. Researchers— This research was conducted by Kyle Rollins and Erick Hollenbaugh with Brigham Young University.